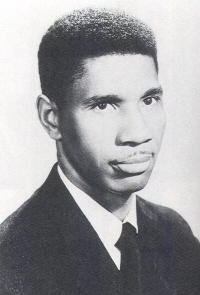 Medgar Evers, at the time of his assassination in 1963, was the Field Secretary for the Mississippi NAACP and thus one of the leaders of the civil rights movement in that state. Evers was born on July 2, 1925 in Decatur, Mississippi. Evers was inducted into the U.S. Army in 1943 and served in Normandy in the following year. After his discharge from the service, Evers enrolled at Alcorn College. While at Alcorn he met his future wife, Myrlie Beasley of Vicksburg and the following year they were married on December 24, 1951. After their graduation from Alcorn in 1952, they moved to Mound Bayou, Mississippi. Evers worked at an insurance agency until 1954. While in Mound Bayou, Evers helped form local chapters of the NAACP in the predominately African American Delta region of the state. However, his unsuccessful attempt in 1954 to attend the University of Mississippi Law School attracted national attention, especially since it came after the U.S. Supreme Court decision declaring school segregation unconstitutional. Evers soon worked full time for the NAACP and moved to Jackson to run the statewide office. Here as state field secretary for the civil rights organization he led a boycott of white Jackson merchants who discriminated against black customers, and investigated racially motivated crimes against African Americans throughout the state. Evers also supported James Meredith’s successful effort to become the first African American to enter the University of Mississippi in 1962. Such high profile leadership of the NAACP angered white supremacists throughout the state. He was assassinated outside his home in Jackson on June 12, 1963. Black and white leaders from around the nation gathered in Jackson for Evers’s funeral and his brother, Charles, took over his position as state field secretary. Byron De La Beckwith stood trial twice in the 1960s for the assassination of Evers and was finally convicted in 1994 and sentenced to life in prison. Evers’s legacy is ever present in Mississippi. Ten years after his death Mississippi had over 250,000 black voters (as opposed to 28,000 in 1963), 145 black elected officials, and African Americans were enrolled in each of the state’s public and private institutions of higher education.